The interest in flying drones has increased over the past few years. Almost every week there is exciting news for the enthusiast. New drones are being released on the market each month, and many of them are easier to fly than ever before. Never has the time been better for the drone beginner to buy one of these drones for fun. Another new drone market that is quickly expanding is commercial drone use. Drones are increasingly becoming popular for businesses. Commercial drones are fitted out with the best snapshot and video cameras so that they can be flown from point A to a point B. There are numerous reasons why a business needs to record photographs and video. In 1898 the first radio controlled device was created by Nikola Tesla for an exhibition at Madison Square Garden. In the ensuing years John Hays Hammond Jr., Leonardo Torres y Quevedo and others had various patents on remote controlled toys. Remote controlled boats, ships, and aircraft all become popular past-times for the scientific elite. Soon it was discovered that these RC devices could be used for warfare. In 1909, the first radio controlled torpedo was invented. Around the 1920s, the military started using RC controlled ships for naval artillery practice. Aircraft and helicopter drones (or quadcopters) are highly sought-after items in toy, spy, and hardware stores. RC flying drones can be just more than toys, they also have many commercial drone uses over a wide range of industries. The more technology develops, the more flying drones are used for a variety of different purposes. Today, RC controlled flying drones are increasingly used in commercial drone use, so many new types of flying drones are invented each year. There’s unlimited potential for RC commercial drone use. One of the major markets for flying drones is the military, and while NASA uses land drones, it could use flying drones in the future of Mars exploration. Other commercial drone use can be industrial, business, and even legal and law enforcement oriented. New laws are starting to govern flying drone usage, as they are increasingly being used for commercial drone use, rather than just as expensive toys for kids or adults. More drones are kitted out with either digital camera or video cameras, as well as sound recorders, and increasingly the digital images taken by these drones can provide exceptionally high full color resolution. The definition of an RC (Radio Controlled) aircraft, is a model or toy that can be controlled remotely, by an operator on the ground. The operator has a hand-held radio transmitter with gadgets, dials and buttons, that sends signals to a receiver on the flying aircraft. The aircraft interprets these signals and can change trajectory, flying higher or lower, or be told to come down for a landing. The FAA in the USA is increasingly wanting to control the use of flying drones, particularly those equipped with recording devices, due to various privacy and security laws. Right now, the definition of a flying drone is RC aircraft devices of less than 55 pounds that can fly up to 400 feet off the ground. Right now, most people are not concerned with recreational use of flying drones, but commercial drone use does raise flags. It could be several more months before any adequate laws on flying drone usage are made. A business will either hire someone, or they’ll purchase their own commercial drones. If a drone business is hired, such as a professional photographer, they will assume all duties for payment, including flying the drone, and recording photographs and video. Commercial drones are useful for real estate agents. While the sale of a small house or condominium may be straightforward, the real estate agent that sells land with a vast acreage, or even a farm, may be in a predicament because it’s different to present a property in less than the 10 or 20 photographs that are allowed on real estate websites. Instead, they resort to a video. But instead of a static video taken on the ground, a flying drone can fly above the ground and take some fantastic video of the buildings, land, lakes, hills, and valleys. 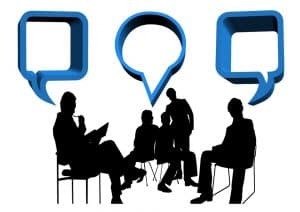 We already know that video placement on a website will increase sales, and that is also applicable on a real estate site where a video will more likely sell a property over a competitor who has only photographs on their real estate site. If you’ve ever viewed scenic footage of a drone flying through the air, you’ll understand how fascinating these videos can be. It’s a different perspective on life that we cannot see merely through our eyes while standing on the ground. Professional videographers may also use drones to film events. A bride and groom may wish to have their outdoor wedding filmed, and a drone video is something unique that will be a great reminder of the ceremony. Drones may also record video for large gatherings such as concerts, plays, and festivals. These videos may be shared on social media after the event and are also a great way to promote the following year’s events. These videos can give a great overview of the event from the air, which may be more difficult to photograph from the ground. Commercial drones may also be used in geodesic works. This may or may not be related to real estate. Regions of land may need to be carefully surveyed, whether it’s a National Park or land that may be split into lots for resale. By now almost everyone has heard about how Amazon has been testing delivery drones in several major cities in North America. The customer will order a product online, and then a drone will take the item from a nearby Amazon fulfillment center, fly through the air, and drop it off at a pre-marked spot on the customer’s property. Amazon has been dealing with a multitude of issues over the past couple years of testing. They began with the drone carrying a plastic Amazon container to the customer, and then they managed to create a drone that would carry one of Amazon’s standard cardboard shipping boxes. There is also the issue that an Amazon fulfilment center may not have the product that the customer is seeking. The half an hour delivery window is now tossed out the door. Will Amazon only offer specific products through their drone delivery service? There is also the issue of safety and aviation laws. Right now, many cities are drafting up laws controlling the use of drones in the city. Amazon will need special permits in order to allow their commercial drones to be flying throughout the streets of major cities. Just how will safety factor into all of this? Using a commercial drone for one wedding or festival, or to record real estate video is a single occasion. Delivery drones will likely need to fly throughout all hours of the business day. How can you keep these drones from flying into adults, children, pets, trees, and property? It can be tricky learning how to fly a drone, particularly in windy conditions. If Amazon is allowed to fly commercial drones for parcel delivery, then other companies such as Walmart and Google—who are also testing their own drones—will also need to be allowed to have their own delivery drones too. Will the sky soon be full of delivery drones? Will a certain portion of the sky be set aside for this purpose? One of the more common commercial drone uses is done by real estate agents. They’ll use drones fitted out with cameras and video recorders to fly around properties, taking photos for real estate sites. Particularly useful for larger properties with vast acreage, commercial drone use can involve taking a complete set of photos and a video, all within a short time frame. This can save a real estate agent valuable time, as they don’t have to spend hours walking the acreage taking photos for a website. Agents say that a flying drone recorded video is a great way to interest potential buyers. Properties that have video images taken from high above the air tend to be noticed more often by interested parties. 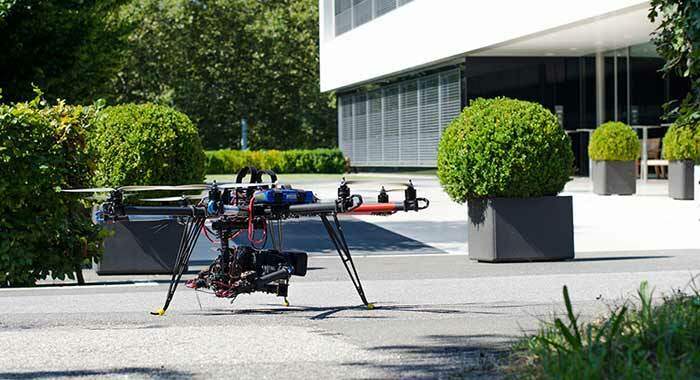 Routes to schools, work, and shops are documented by flying drones. Commercial drone use can film large acreage, farms, and even land developments, before the concrete has been poured. So, it’s no secret that more real estate agents are purchasing drones as part of their real estate selling tools. Drones can be used in the policing professions as spy cameras. Often they’re equipped with infrared technology to aid them in the evenings with finding criminal offenders. Commercial drone use can also be used for spy cameras in the investigative industry, to collect information on people. Flying drones come in a variety of price points, and when you’re first starting out in commercial drone use, you probably don’t want to spend a lot of money, until you’re certain of its usefulness. The Hubsan X4 H107C 2.4G with Camera and Light in Green is a fun and compact flying drone for fun or commercial drone use. The quadcopter is made from sturdy ABS material, able to withstand blows and sudden landings. It comes in an attractive green and black color. This flying drone is perfect for taking photos during daytime or evening, as it has a built-in light. It functions up, down, backwards and forwards, left, right, hover, and tumbling. There’s also a battery and charging indicator so you know how much charge you have left. Charging time takes fifty minutes, for up to 20-40 minutes of flying time. Included in the box is: quadopter, power adaptor, extra propellers, radio controller, USB converter cable, and manual. The Syma X5C Explorers 2.4G 4CH RC Quadcopter With HD Camera is another great flying drone for commercial drone use that is available in a white plastic finish. It can be used indoors or out, and has a nine-to twelve minute flight time. The Syma has a built-in video camera for taking outstanding videos, that can then be downloaded onto your computer afterwards. The Syma boasts a faster reaction speed than other flying drones. The latest gyroscope technology keeps your flying drone helicopter stable and upright. The box contains: one Quadcopter, radio controller, USB cable, and manual. While the FAA works on rules to govern drones in public areas, people continue to find new and exciting ways for commercial drone use. As flying drone technology continues to evolve, flying drones for commercial use continues to be welcomed in nearly every industry across the country. Until cities clamp down on commercial drone usage, there are still some great commercial drones for sale. These drones are commonly used by videographers for their businesses, or for businesses who can afford to buy their own drone. Buying your own commercial drones means that you can use it at any time, rather than having to hire a photographer and then book an appointment. Commercial drone prices generally start at around $1200, and then go up from there. There are many that are priced at over $5000, though most small businesses won’t be interested in those. 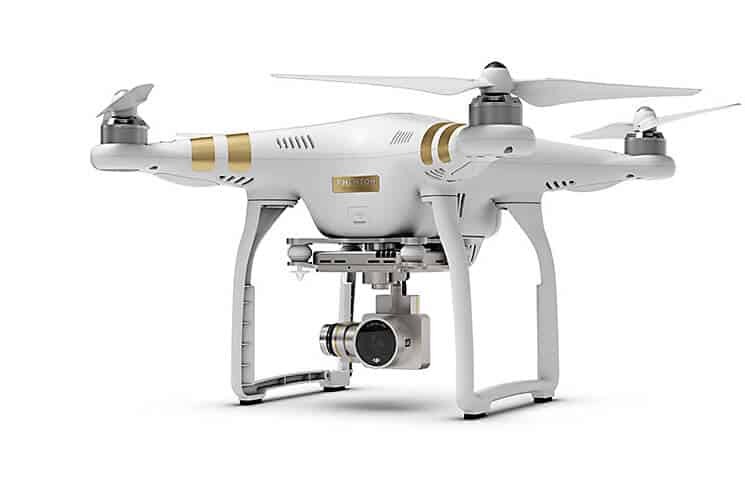 The DJI Phantom 2 and Phantom 3 are popular choices for people who wish to use flying drones for commercial purposes. The 2 is an earlier release than the 3 but both are still great for the business who needs to record professional quality video. One comes with video camera while the other doesn’t, but you can add any Go-Pro compatible camera to the drone’s gimbal. The Phantom 2 promises to make learning how to fly a drone easier than if you simply purchased a toy. This drone is completely customizable, making it attractive to the business owner who wants to use it for their business. You can attach a gimbal, which holds the video camera. While you could buy the Phantom 3, which already comes with a gimbal and video camera, many people like the customization on the Phantom 2, so they’ll prefer this choice instead. There are three different types of gimbal to attach to the Phantom 2. You can choose from the Zenmuse H3-2D, the HD3-3D, or the H4-3D. 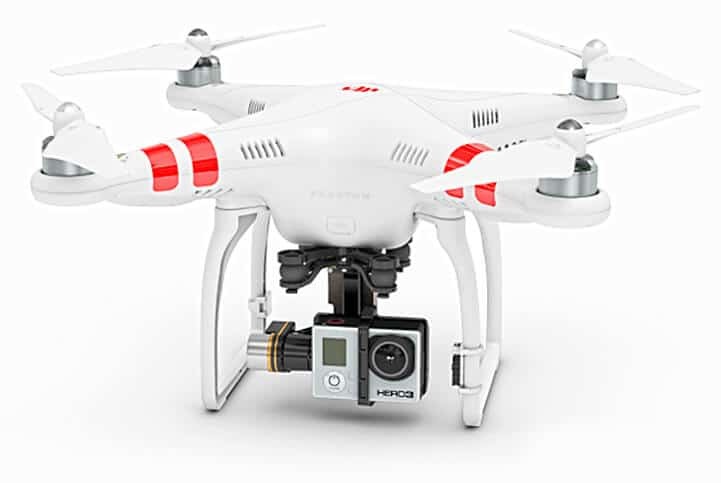 When you’re shooting video for commercial purposes, you’ll love the preprogrammed flight option of the Phantom 2. This enables you to enter your flight path, and then let the drone take over. This gives you more of a hands off feature, so you can enjoy watching the video it’s recording. This will decrease your time on the field, so that you can get back to the office to edit the video for your commercial purposes. In order to program your flight path you do it through the use of an app on your iPhone or iPad. The Phantom 2 will make it easy to fly, so you can concentrate on collecting the best aerial footage, rather than figuring out how to keep your drone in the air. It’s not only lightweight, it’s durable too. Crashes are bound to happen, so it’s good to know that your investment is protected. You can pack your 2 into your backpack and hit the road. There are some other great features on this commercial drone. The propellers are self-tightening, so you won’t need to be spending time doing this. The remote control unit has a trainer port which can be attached to your computer. This will help you to learn how to use your controller before you need to take it out on the field. Having a good grasp of how each button works is important before heading outdoors. A throttle locking feature will hold the stick in place, so your fingers don’t get sore. The Phantom 2 has built-in no-fly zone technology, so you won’t be invading military or commercial flight space. The drone will return to base with the press of a button. Even if the commercial drone pilot is a beginner, the Phantom 2 will make learning simpler, so you can focus on your business. The Phantom 3 differs a bit from the Phantom 2, despite being a more recent release. It already comes with a gimbal and camera. This may be perfect for the future drone pilot who doesn’t want to spend a lot of time and effort to find what they need—they simply want to remove from a box and go. Besides being easy and safe to fly, there are many other great features of the Phantom 3. The video camera is professional quality, and it will be hard to find a better camera in a drone. The stable flight control system will help to keep the video images smooth and sharp. The drone pilot may actually adjust the angle of this camera while in flight. The drone itself is intuitive, which aids in the flying, particularly during windy days. The camera included with this drone is 1080 megapixels. The camera sits on a stabilized gimbal system. The video and photographs taken with this camera will appear to be professional film quality. You can operate the drone and the camera from a smart phone or tablet. A live video feed will show you what your drone is recording, through the live video feed. On your screen you’ll also see a GPS map so you can see exactly where your drone is, even if it’s nearly out of sight of your vision. You can use this GPS map to take it out of your sight, or to fly it back to you. There is also a return to home button should you start to tire of flying. It will also automatically return to you should it begin to lose contact with the controller. You’ll find many other benefits of the built-in GPS system. This drone is great for the beginner, expert, or pro. There are beginner controls that can be turned off as you increase your flight experience. There’s no need to buy another drone while you learn, as it grows with you. The Phantom 3 has some bright LED running lights which will not only help you to discern which way the nose is pointing, but also to help you to fly the drone in the evening. The video camera will shot at 2.7K video, promising three times higher resolution than an HD television. The camera shoots video at 30 frames per second, and up to 40 frames per second for perfect video. Besides video, you can also take snapshots. You can save them as jpegs or in raw format. The camera has an f/2.8 aperture, 20 mm lens, and 12 megapixel photos. As drones become increasingly popular for commercial purposes, in the future they may have some uses that we can currently only dream about. Perhaps drones will be used for video surveillance, alerting the police if there are burglars or trespassers who cross its borders. Drones may be equipped with alarms to warn these people that they’re where they shouldn’t be. This could be particularly good for monitoring vast acreage where fences aren’t possible. Like robots, perhaps drones would be able to perform household tasks. They may be able to drop off letters to the post office, or drop off dry cleaning. Perhaps they could be used to carry recyclables from the home to the nearest recycling depot. No matter what purpose you have planned, a commercial drone can help you with the promotion of your business, as well as increase its service range. Once you have your drone in hand you may figure out more uses for your commercial drone.